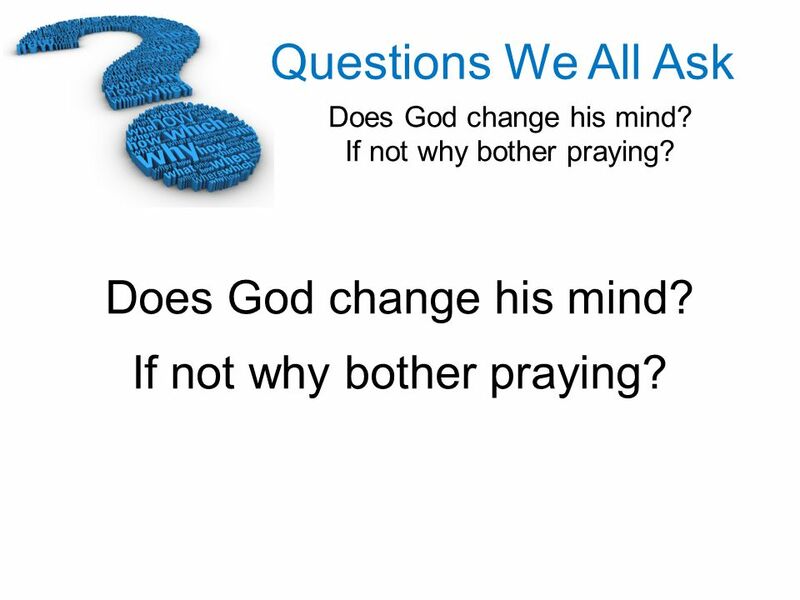 1 Does God change his mind? 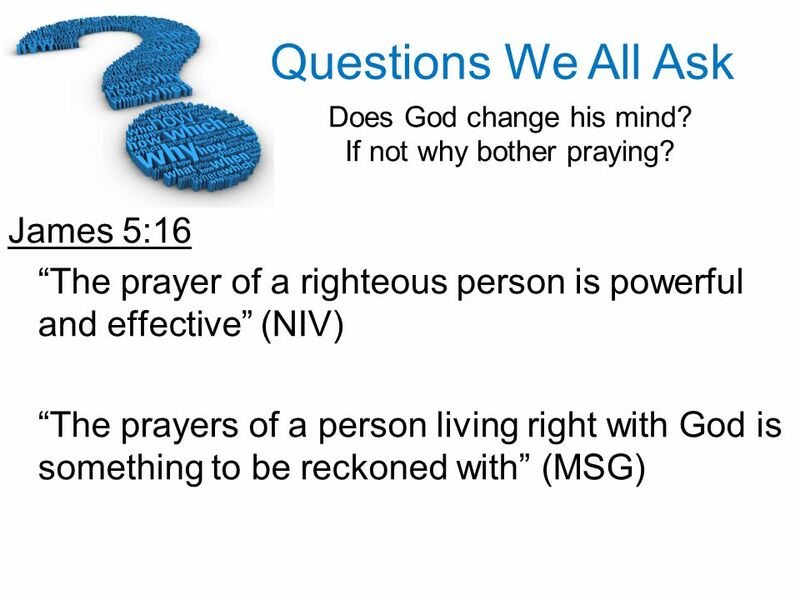 If not why bother praying? 3 1. 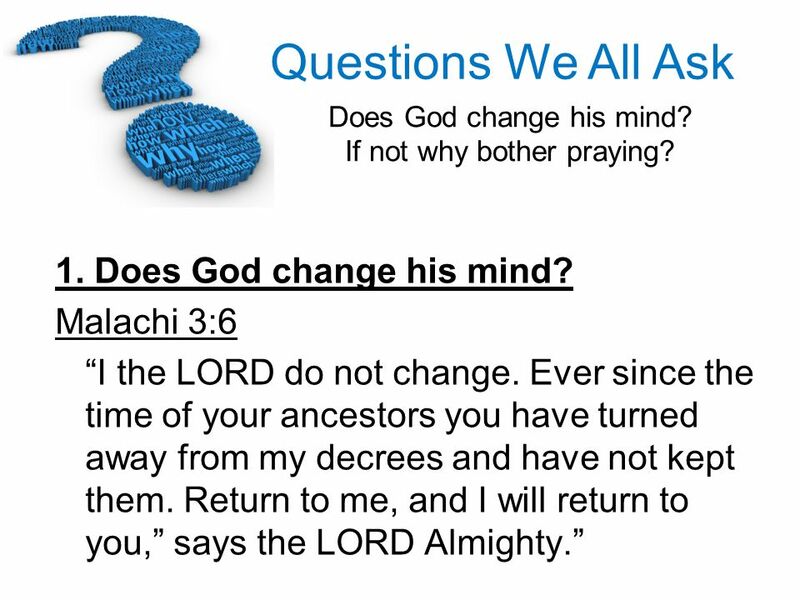 Does God change his mind? 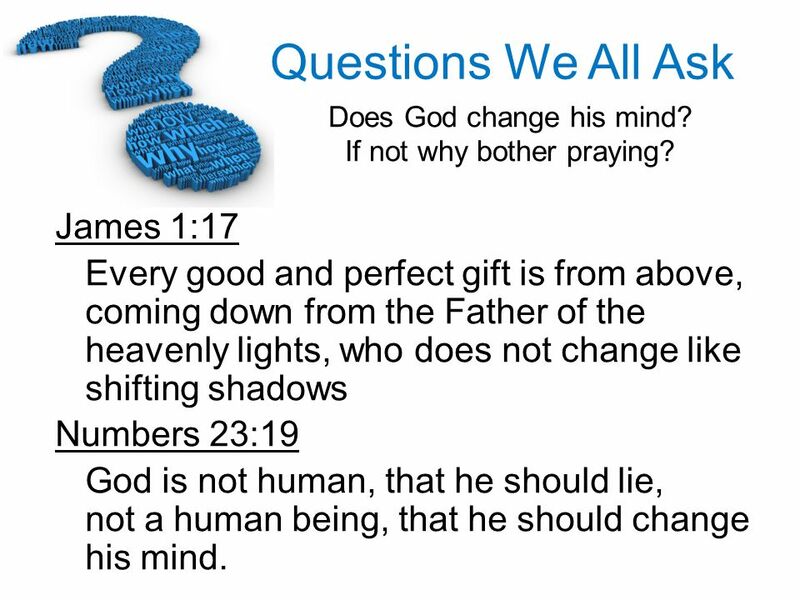 4 James 1:17 Every good and perfect gift is from above, coming down from the Father of the heavenly lights, who does not change like shifting shadows Numbers 23:19 God is not human, that he should lie, not a human being, that he should change his mind. 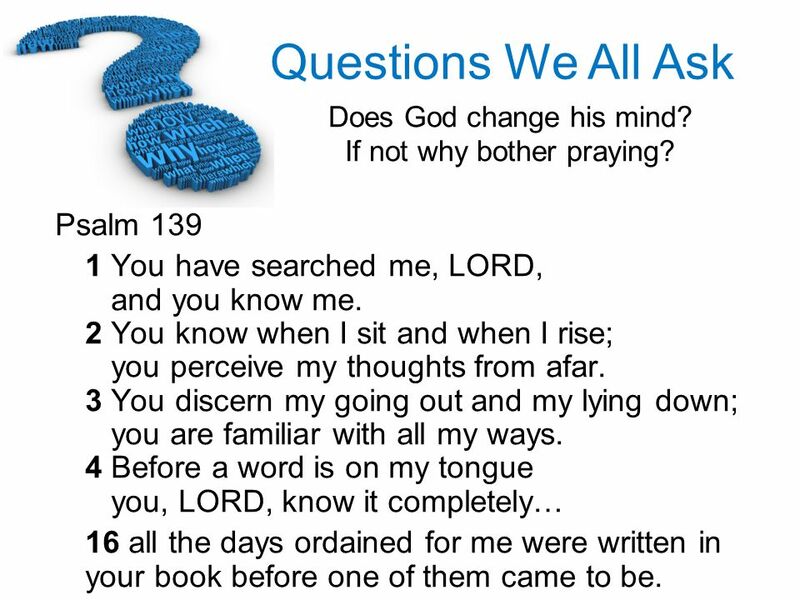 6 Psalm 139 1 You have searched me, LORD, and you know me. 2 You know when I sit and when I rise; you perceive my thoughts from afar. 3 You discern my going out and my lying down; you are familiar with all my ways. 4 Before a word is on my tongue you, LORD, know it completely… 16 all the days ordained for me were written in your book before one of them came to be. 7 2. 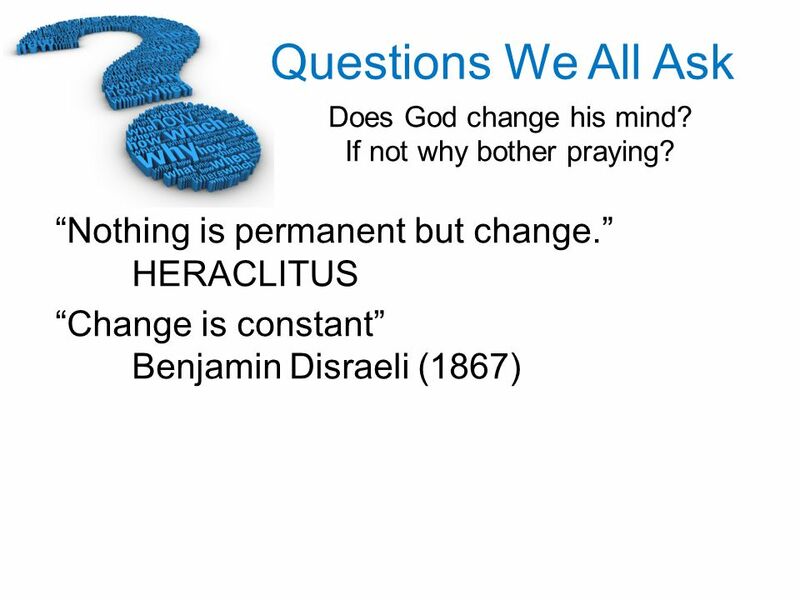 But what do we do with accounts where God seems to change his mind? 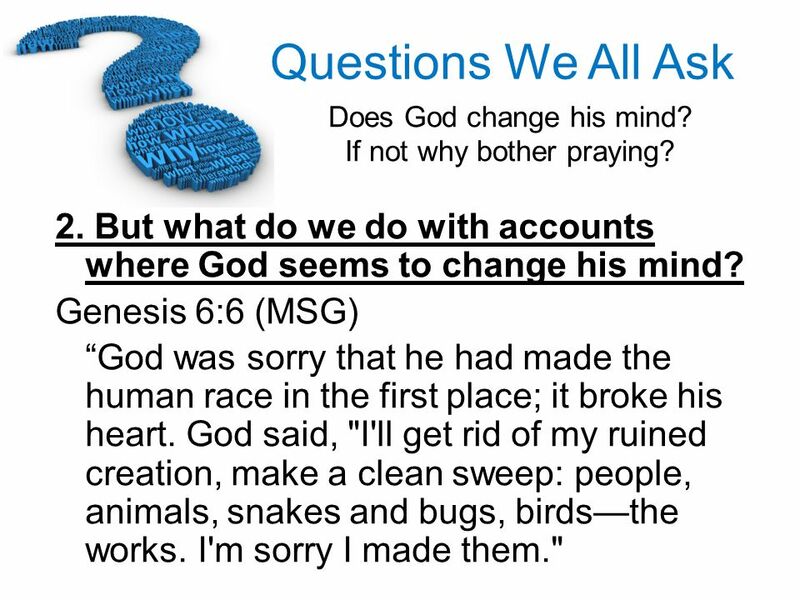 Genesis 6:6 (MSG) “God was sorry that he had made the human race in the first place; it broke his heart. God said, "I'll get rid of my ruined creation, make a clean sweep: people, animals, snakes and bugs, birds—the works. I'm sorry I made them." 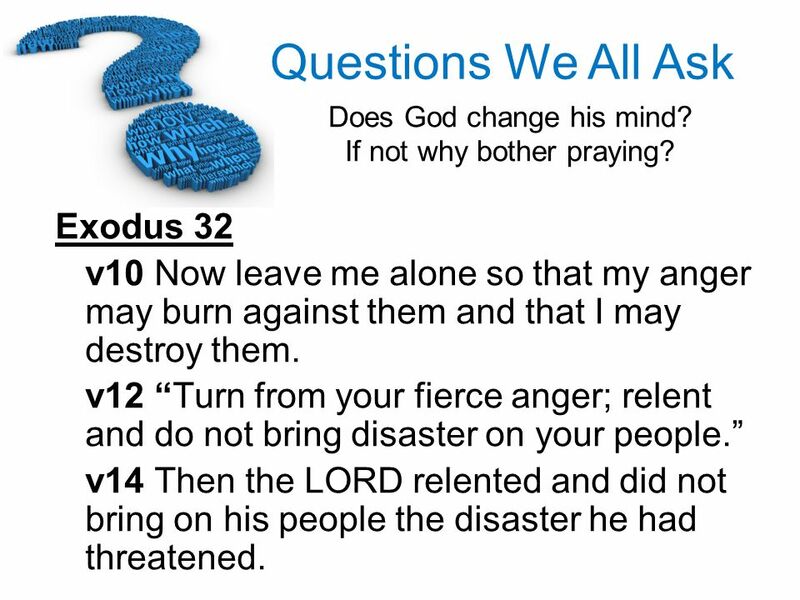 8 Exodus 32 v10 Now leave me alone so that my anger may burn against them and that I may destroy them. v12 “Turn from your fierce anger; relent and do not bring disaster on your people.” v14 Then the LORD relented and did not bring on his people the disaster he had threatened. 9 Jonah 3:9-10 “Who knows? 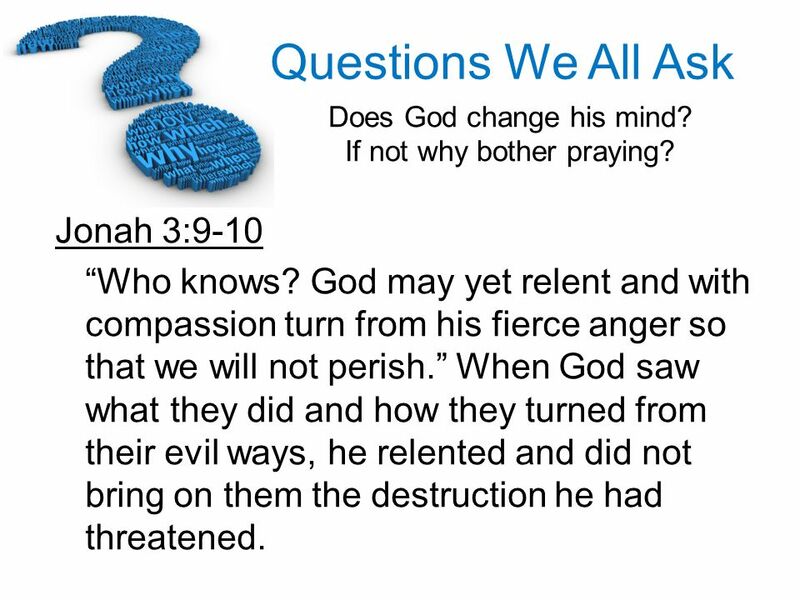 God may yet relent and with compassion turn from his fierce anger so that we will not perish.” When God saw what they did and how they turned from their evil ways, he relented and did not bring on them the destruction he had threatened. 11 3. 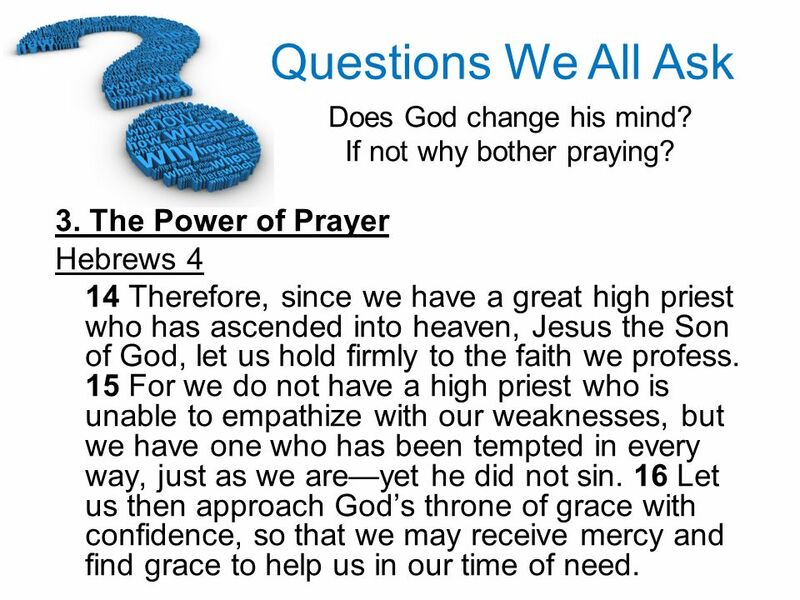 The Power of Prayer Hebrews 4 14 Therefore, since we have a great high priest who has ascended into heaven, Jesus the Son of God, let us hold firmly to the faith we profess. 15 For we do not have a high priest who is unable to empathize with our weaknesses, but we have one who has been tempted in every way, just as we are—yet he did not sin. 16 Let us then approach God’s throne of grace with confidence, so that we may receive mercy and find grace to help us in our time of need. 15 Does God change his mind? 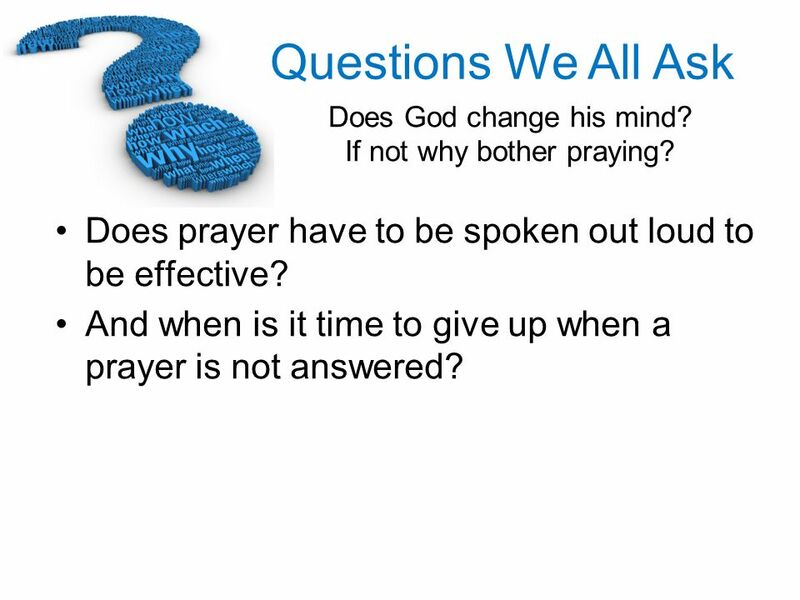 If not why bother praying? 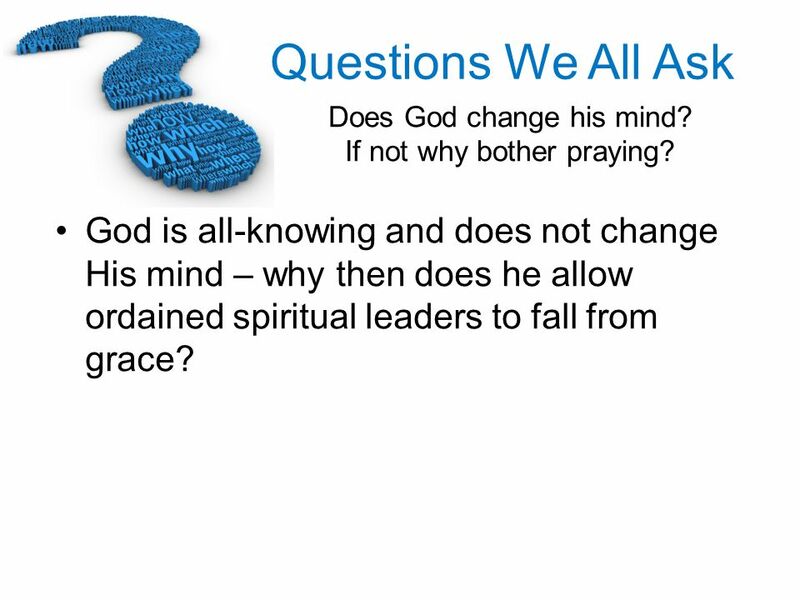 17 God is all-knowing and does not change His mind – why then does he allow ordained spiritual leaders to fall from grace? 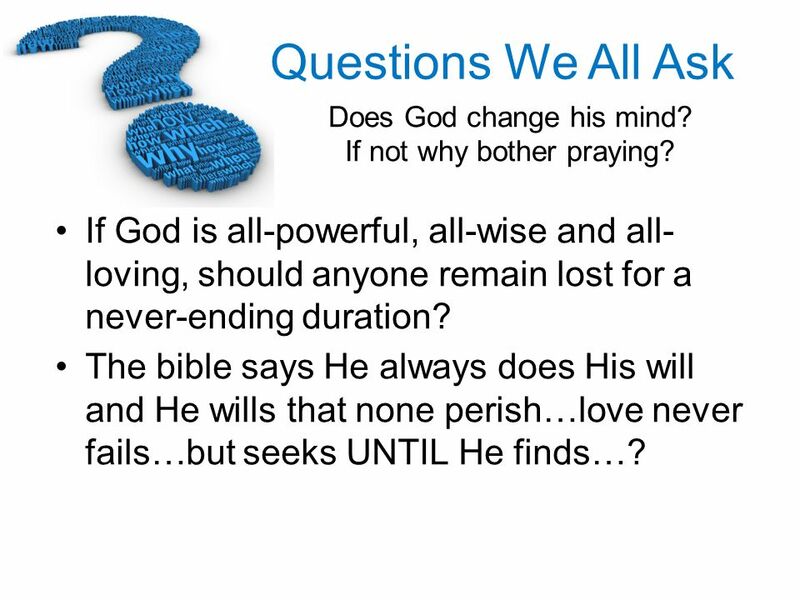 18 If God is all-powerful, all-wise and all- loving, should anyone remain lost for a never-ending duration? The bible says He always does His will and He wills that none perish…love never fails…but seeks UNTIL He finds…? 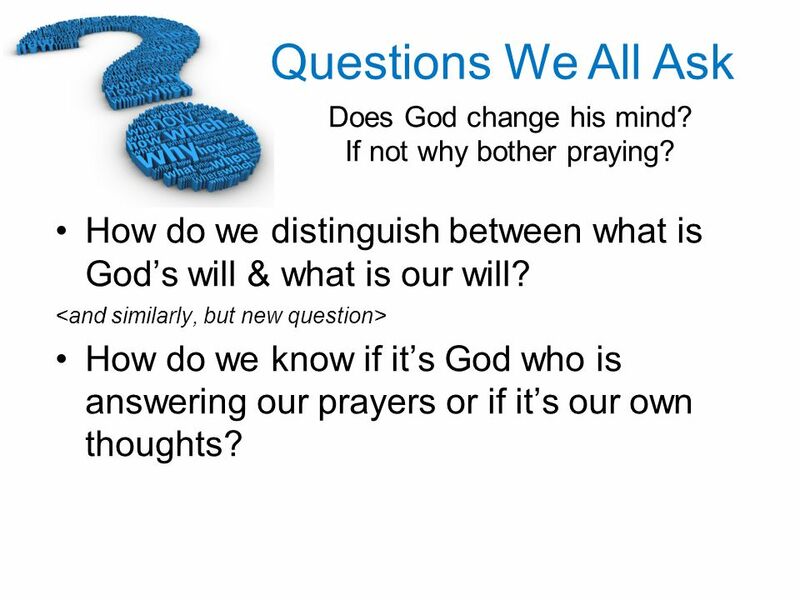 19 How do we distinguish between what is God’s will & what is our will? 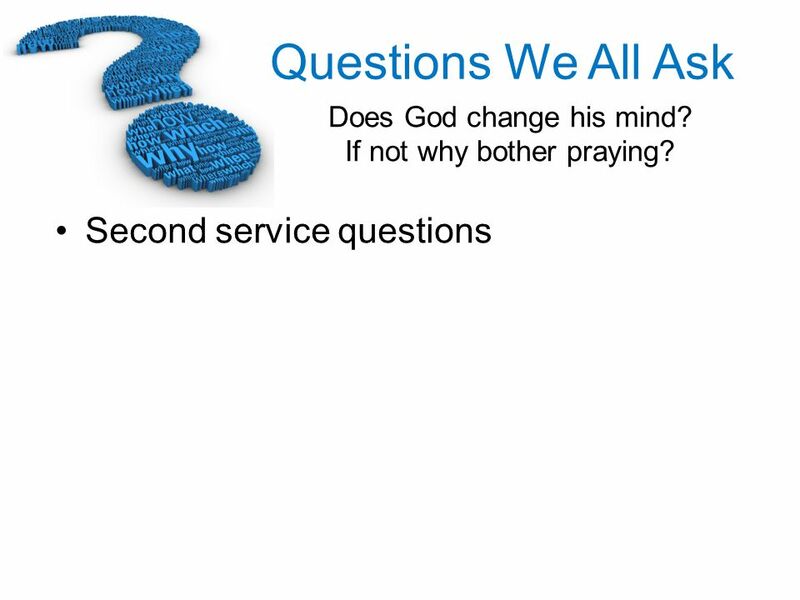 <and similarly, but new question> How do we know if it’s God who is answering our prayers or if it’s our own thoughts? 20 What about the people who don’t hear about God? 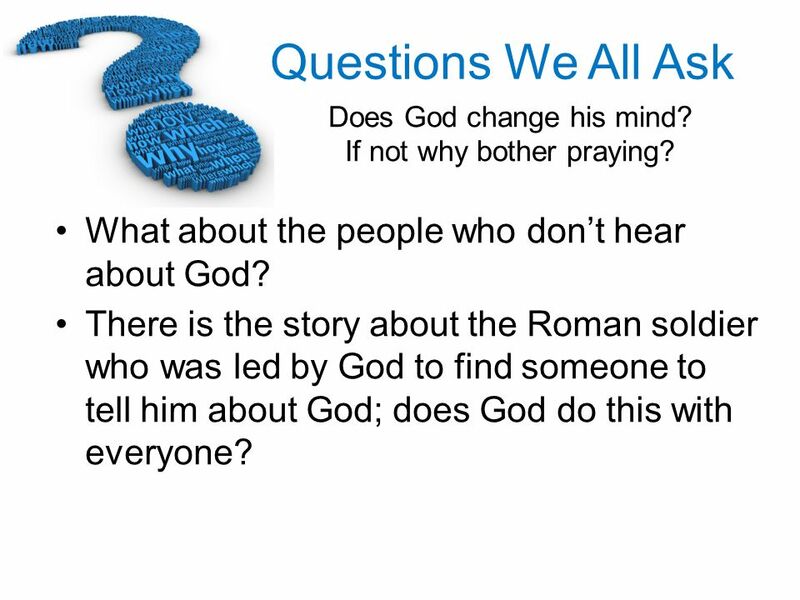 There is the story about the Roman soldier who was led by God to find someone to tell him about God; does God do this with everyone? 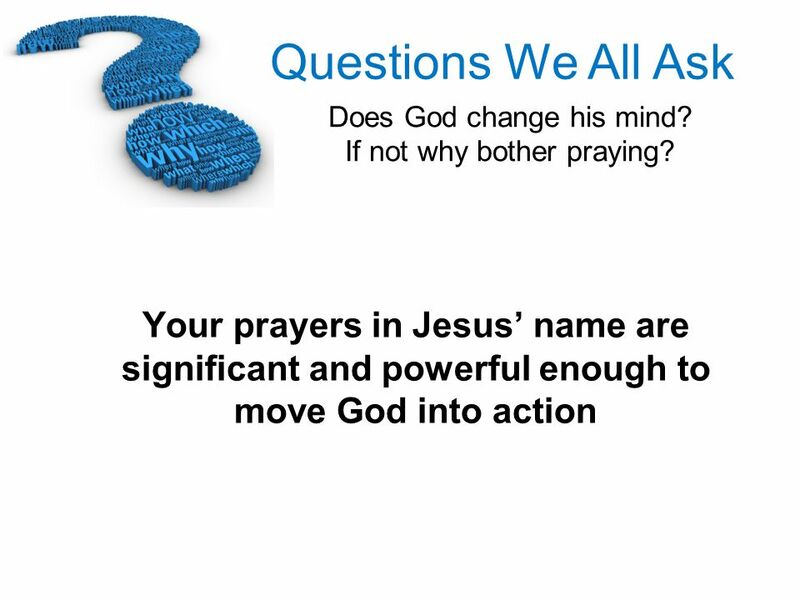 23 Does prayer have to be spoken out loud to be effective? 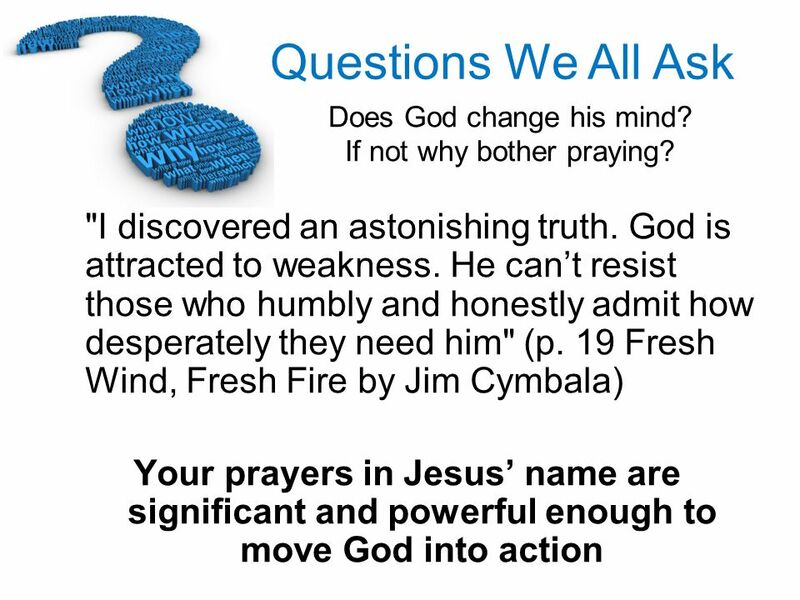 And when is it time to give up when a prayer is not answered? 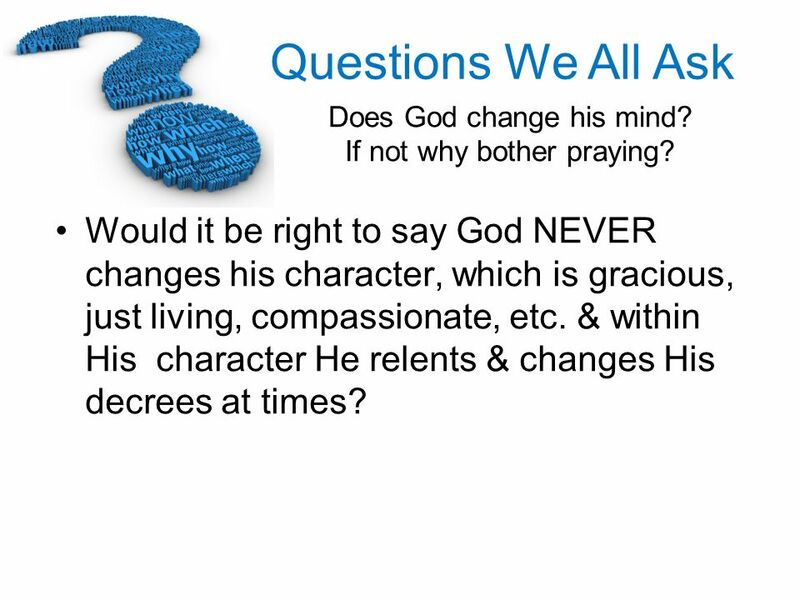 24 Would it be right to say God NEVER changes his character, which is gracious, just living, compassionate, etc. & within His character He relents & changes His decrees at times? 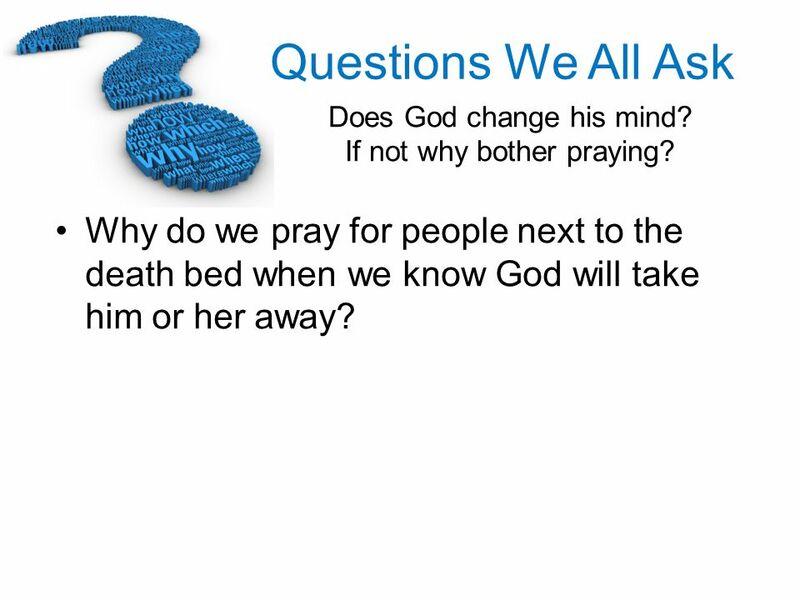 25 Why do we pray for people next to the death bed when we know God will take him or her away? 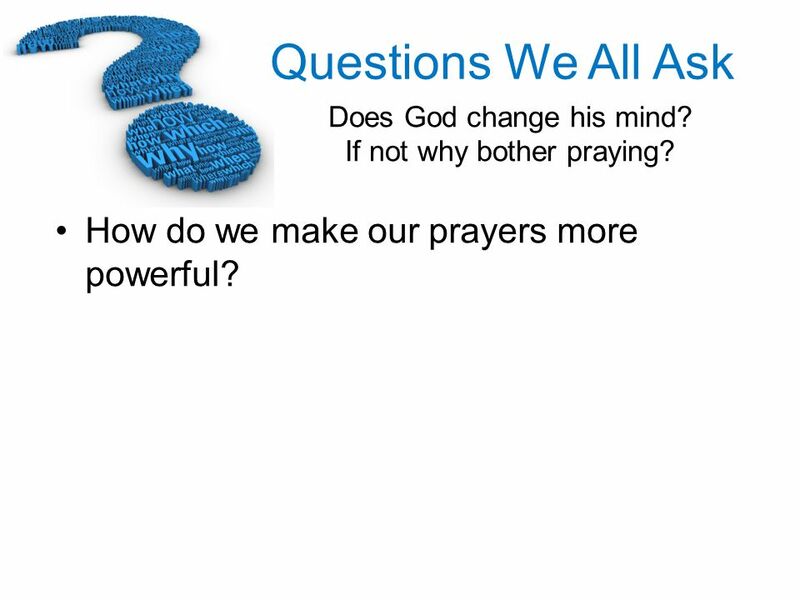 26 How do we make our prayers more powerful? Download ppt "Does God change his mind? 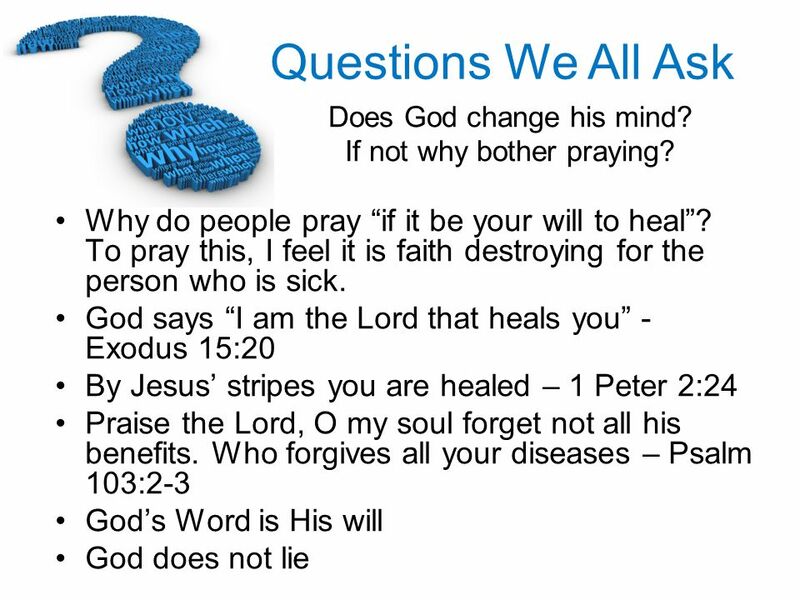 If not why bother praying?" Hebrews Chapter 4 Today, Hearing God leads to Faith in God which leads to Work for God which leads to Gods Rest. Malachi: Malachi: A Message For the Madness. LoveLove NamesNames BreadBread MeMe SnuffSnuff PriestsPriests MarriageMarriage WordsWords FairFair StealingStealing. 1 Corinthians 3:1 Brothers, I could not address you as spiritual but as worldly— mere infants in Christ. 9 letter word And the word ‘SPIRIT’ takes 6 letters…double. Rom. 8:26 “In the same way, the Spirit helps us in our weakness. 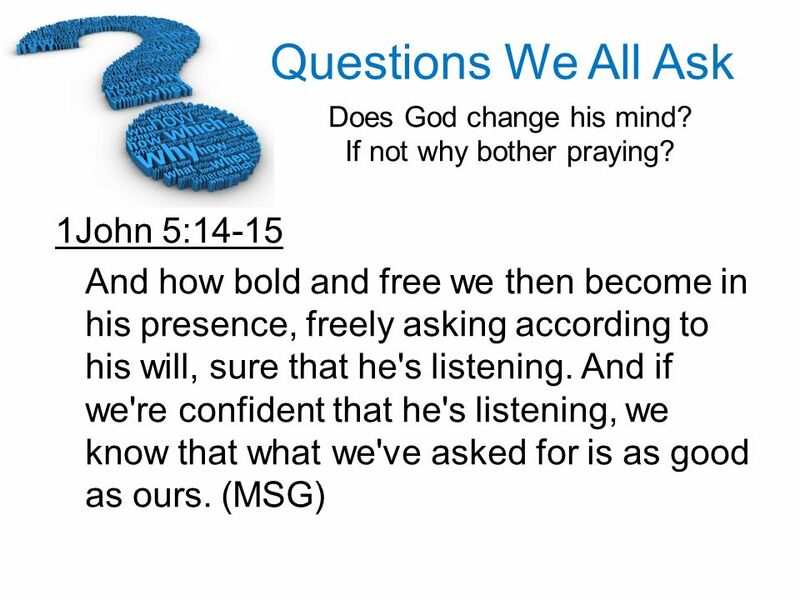 We do not know what we ought to pray for, but the Spirit. Hebrews 4:  Opening:  How strong is your faith?